unemployment rate among blacks up to 16.7% in August, nearly double the national average. The problem is the Congressional Black Caucus' chief concern and one many members have pushed the White House to do a better job of addressing. As President Barack Obama prepares to speak at Saturday night's 2011 Congressional Black Caucus Foundation Phoenix Awards Dinner, he is likely to tout some of the proposals in the American Jobs Act he introduced this month. Several are aimed at tackling the problem of long-term unemployment, steps that could provide much-needed aid to the community where the jobless rate is highest. One CBC member who has been especially critical of the president in recent months is Rep. Maxine Waters, a Democrat who represents California's 35th congressional district. At a CBC jobs tour town hall in Detroit in August, she said black unemployment was "unconscionable," the strategy to fix it was unclear and that the caucus was "getting tired" of waiting for one. Earlier this month, she questioned the president's decision to focus on the Midwest during a three-day jobs bus tour in August, saying the 3 million population of Iowa, an electorally important state that is also mostly white, is roughly equal to the number of African Americans who are out of work and suggesting that the population of that key state seemed more important to the administration than the black community. "Are the unemployed in the African-American community, including almost 45% of its youth, as important as the people of Iowa?" she asked in the statement she released ahead of the president's speech before a joint session of Congress in which he announced his jobs plan. The White House is well aware of this criticism from some in the black community and has made a point of trying to address it. "The president shares the frustration of African-Americans and all Americans about the pace of the economy," said Kevin Lewis, the White House director of African-American media. "Though the president is committed to improving the economy for all Americans, he'll note in tonight's speech that the American Jobs Act includes targeted initiatives and programs that protect, support and provide economic stability for the most vulnerable Americans. He'll continue to urge Americans to urge Congress to act in bipartisan fashion and pass the bill." The president has proposed a $4,000 tax credit to employers for hiring long-term unemployed workers and higher credits to companies that hire veterans who have been unemployed for at least six months. He also wants to see unemployment insurance extended to prevent 5 million Americans from losing their benefits and stronger programs to help the long-term unemployed through counseling and job training. 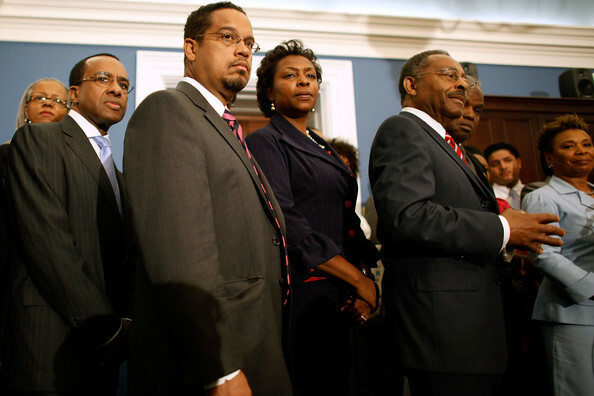 A number of CBC members -- including Missouri Democrat and CBC Chairman Rep. Emanuel Cleaver and Democratic representatives like John Lewis of Georgia and Frederica Wilson of Florida -- released statements of support for the American Jobs Act after the president's speech, as did other black leaders like Philadelphia Mayor Michael Nutter. Waters also praised the plan in television interviews after the speech, though she said she and other CBC members wished the plan was "even bigger" and that she hoped the kind of help proposed would get to the people who need it most. More than anything, CBC members want to see the president fight hard for the jobs plan and not give in to any demands to weaken it. Members' staffers have spoken of concerns that the White House did not negotiate from a position of strength with past bills, such as the Dodd-Frank financial regulatory overhaul or the health care overhaul, and say they hope the president has learned a lesson from those experiences. While some African-American critics of the president have argued he has not done enough to listen to the concerns of the black community, his recent schedule shows he has spent time meeting with black journalists and with the leaders of organizations that serve the community like the NAACP's Ben Jealous, the National Urban League's Marc Morial and the Rev. Al Sharpton from the National Action Network. At a panel this month with black media group Interactive One, one of the president's top advisers, Valerie Jarrett, called the unemployment rate in the black community "unacceptably high" and said the president understood that "inaction is not an option." In remarks to the panel, the president said 20 million African-American workers would benefit from the jobs bill proposal to cut the payroll tax in half, a measure he said would save the average family $1,500 a year. "It helps out-of-work Americans, including the 1.4 (million) African-American folks and their families who are out of work by extending unemployment benefits to help support them and their families while they're looking for work," the president said. "And it also reforms the training programs that are available so that they can build real skills and connect to jobs. And that will particularly help the long-term unemployed." The president also taped an interview with BET Networks, set to air Monday, in which he is expected to specifically address the "increase of unemployment among African-Americans since taking office, the current economic crisis, the political landscape around the 2012 presidential election" among other issues, according to the network.